Taking time off from running since my last marathon has reminded me why I love it. I love training, but it does leave me kind of feeling burnt out. I technically had been training since February of this year. All of my runs were “scheduled” and I had a plan to follow, but now I’m finally not training for anything specific. I’ve only run 3 times since my marathon on November 8th and two of those runs were only 1 mile. And that’s okay! I needed the break and I wanted to start focusing on cross training by starting Kayla Itsines’ Bikini Body Guide program again. And the great thing about getting to miss running is that it reminds me why I love it. So I thought I’d do a Top 10 Reasons I Love to Run. It gets me outside. I spend significantly more time outdoors than I ever did before I was a runner. Especially in the Winter. I love that running forces me to get out and get fresh air. Gives me time to listen to music/ podcasts. Running for hours at a time means I can have my headphones on for hours. I love using that time to catch up on some favorite artists and podcasts. Plus it makes the miles fly by. The runner’s high. Running just makes me feel better. The endorphins are addicting. I love that little high I get at the end of every run. It’s alone time. Most of the time. I love having running buddies, but sometimes it’s nice to just be alone with my thoughts. I don’t mind being alone and sometimes I really need the time to think. It keeps me fit. I think running is such a great calorie burner. It’s mostly because I love it and the time passes more quickly than any other type of exercising, but still. I love that I can easily burn 500 calories in the morning out of pure enjoyment. Gives me goals. I love that I’m always striving to be a better runner. Constantly working towards a goal is motivating. I love that running gives me the opportunity to better myself and see how hard I can work. Alleviates stress. I can’t tell you how many times I’ve gone for a run when I was stressed out and instantly felt better. I’d go crazy if I didn’t have this outlet. Running gets me. You get out what you put in. I love that you can’t cheat at running. Running reminds me that you get out exactly what you put in. If you don’t put in the training, you won’t feel great at your race. It’s fair. Running makes you work for it. The great community. I love that running helped me find the amazing running community. The motivation from other runners helps so much. I love being reminded that other people are just as crazy about this sport and love to encourage others. It’s awesome. It makes me happy. I feel like I am one of my happiest selfs when running. I literally smile during part of every run. I love that I’m able to run. I wouldn’t be the same person if I didn’t. I am blessed to be a runner. I love that I run and I love how it changed me as a person. Sometimes I need to take a step back and remind myself of this. A break can be good, but I can never stay away from running for too long. Planning on starting the Runner’s World 37 day Run Streak on Thursday! 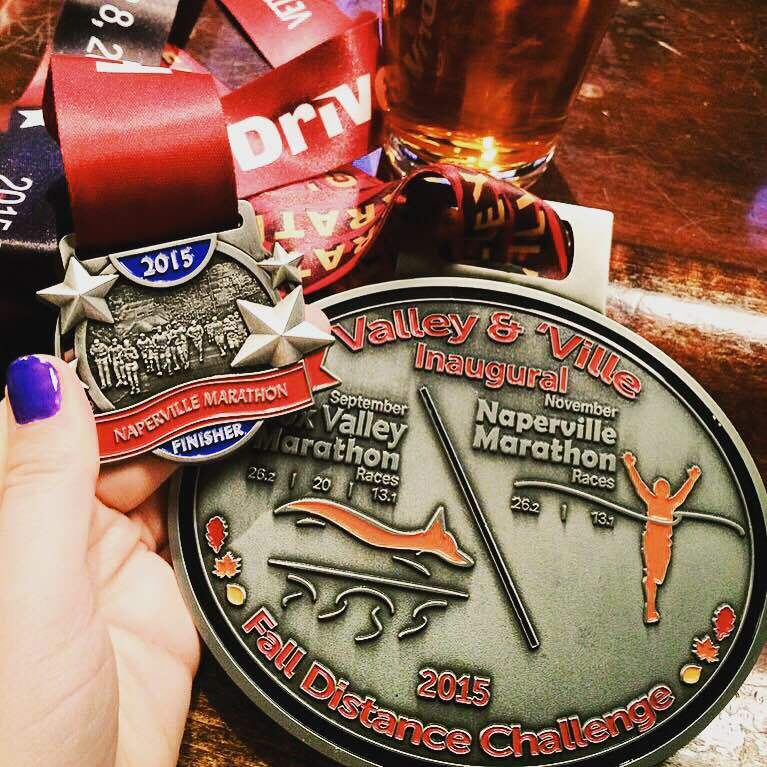 The Naperville Marathon was such a success for me. I honestly doubted I could even get to that finish line without having to walk a lot since I had just run a marathon a few weeks before, but it turned out better than I could have hoped. The expo was easy to get to and easy to navigate. I went on Saturday and took my time walking through. Even bought some socks and a quarter zip with last years date because it was on clearance. I was a spectator at that race, so it counts right? I couldn’t pass it up. I had a relaxing evening eating pasta for dinner and then watching a movie with some friends. Got to bed around 11 pm and set my alarm for 5:30 am. I had a whole grain waffle and a banana for breakfast on the way to the race. We didn’t arrive with much time to wait around, but I’m glad. Carly and I got right into the starting corrals and found Lexi and her boyfriend since the half marathon and full marathon all started together. We all ran the first mile together, then Lexi slowed down and her boyfriend sped up. 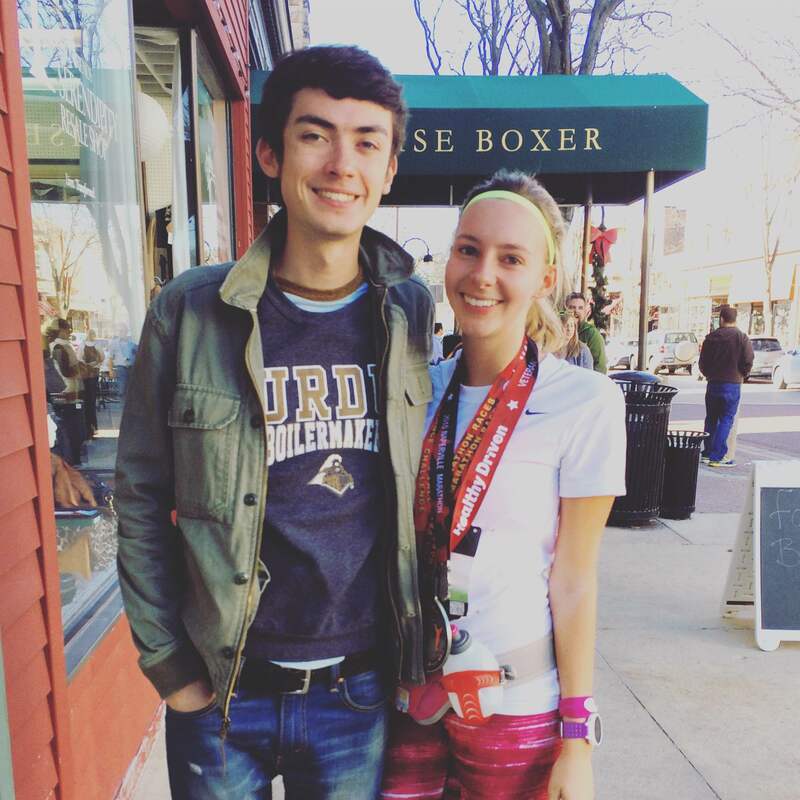 I decided to stick with Carly and try to pace her to run her first sub 2 hour half marathon. I figured it would be better for me to take it easier on the first half since I went out way too fast at my last marathon. We got into a groove and were running solid miles, but the hills were killing Carly. I’m lucky I live in such a hilly area so hills don’t bother me much, but they’re definitely hard if you’re not used to them. We slowed down, but were still going to be close to hitting the 2 hour mark. Unfortunately, miles 11 and 12 Carly felt like her legs weren’t moving. She still ran about 9:40 miles, but it wasn’t enough to break 2 hours. Next time! Really proud of her. 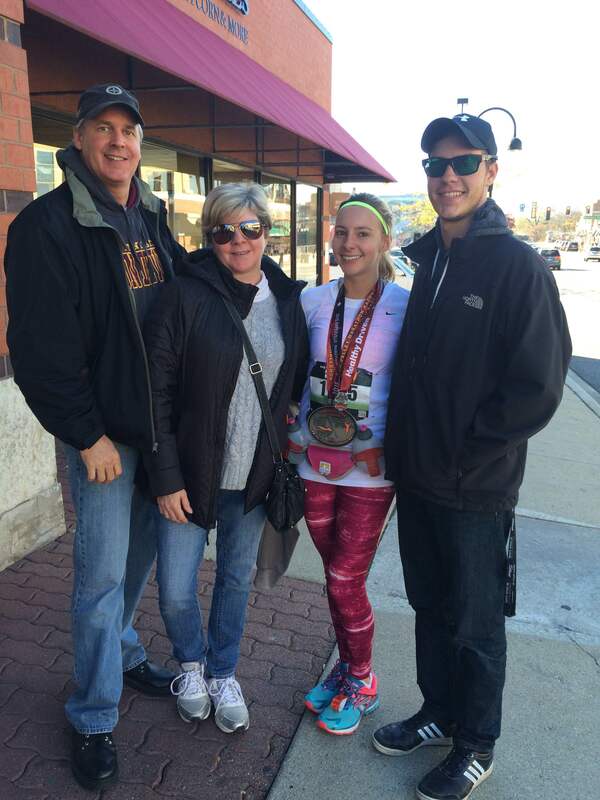 She finished in about 2:02 and I loved having the company for the first 13.1 miles. After I made the turn to head towards mile 14 and Carly went towards the finish, I picked up speed. I had to pee and rather than try to hold it and then have no choice but to stop at mile 24 and lose 5 minutes due to locked legs (lesson learned from my last marathon), I stopped at the next out house I saw. It was a quick 45 second stop and then I was on my way. SO happy I did this. I hate stopping, but it was necessary and I was much smarter this time around. I felt great for miles 14-18. I picked up speed each mile. At mile 18 my left ankle felt like it “locked”. I’m not exactly sure what happened, but it caused me to change my stride. I favored my right leg for the rest of the race. It wasn’t a pain that caused me to stop, but something was definitely off. It freaked me out a bit, but right at the mile 19 marker “Fight Song” came on and I knew I could make it. I sang along a bit and realized 7 more miles really wasn’t that far. I continued to pick up speed. Last marathon, miles 22-25 were awful. I kind of bonked, had to stop and pee, walked for about five minutes, and felt defeated. I still had a great time, but I did not finish well and it kind of made the finish line feeling “less happy”. This race was the exact opposite. I felt GREAT. I didn’t walk at all. I loved all the spectators along the way and said thank you to everyone who called out my name or bib number. They make such a difference. I swear I had a smile on my face the whole last 6 miles. I was SHOCKED by how great I felt. Each mile was getting faster and going by quicker. I felt like in the blink of an eye I was nearing the finish line. This is how I should always feel. Mile 25-26.2 was my fastest of the race at 8:25 pace. I really didn’t have expectations going in to this race, but I definitely did not think I would have another sub 4 hour marathon. Running to that finish line was amazing. People were screaming. I felt on fire. 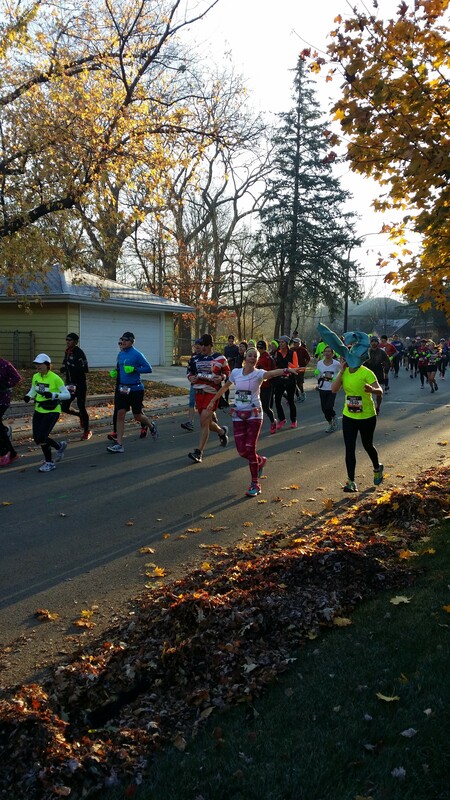 I passed my family just after the 26 mile marker and shouted, “Now this is how you run a marathon!”. Talk about a runner’s high. I even shed a couple tears as I got my medal. I finished at 3:55:50. Only about a minute and a half slower than my PR at my October 10th marathon, but the difference in how I felt was amazing. I was so happy. Sure, my legs hurt and I was tired, but not exhausted or in any real pain. I wasn’t nauseous or dizzy like last time. I was fine. I’ll never forget this race. I never thought I could run two marathons in a month, let alone two sub 4 hour marathons. It’s true that you never really know what you’re capable of until you try. I’m so glad I tried. This race was so well organized. I got my extra medal for the Valley and ‘Ville Fall Distance Challenge so easily. (That thing is huge!) Found my family easily and then we went to nearby bar to get my free “Victory Lap” beer. The weather was perfect. About 50 degrees and sunny at the end. And I truly felt on top of the world. I couldn’t have done it without my support system. I am lucky to have my family, friends, and boyfriend at all my races. They’re the best fans! Marathon week is here again. Didn’t I just have one of those? Still kicking myself for signing up for an extra marathon on a 20 miler runners high. A rookie mistake, but I’m excited nonetheless. Foam rolling – I do not enjoy foam rolling, so I don’t do it as often as I should, but I force myself to roll for a bit every day of marathon week. Higher water intake- I attach my Camelbak to my hand (okay not actually). I try to drink an extra 40 ounces of water a day than I usually do. Extra sleep- Less running gives me more time to sleep. I try to get to bed earlier and I take full advantage of that extra hour in the morning. Stretching- I try to stretch for awhile before bed every night. This week in particular I am doing a few yoga poses each day. I’m really trying to make yoga more of an every day occurrence. Reflection- I like to go through old race photos and think back to what went well in the past. It makes me more excited than nervous. I’ve done it before, so what’s another marathon, right? Nutrition focus- I try to avoid sugar and alcohol all week. Emphasis on try. If not the whole week at least the three days leading up to the race. I eat more carbs, but not a crazy amount. I always have a carb heavy dinner the night before the race. As far as running goes, I only run three times the week before a marathon. A 3-4 mile run on Tuesday and Wednesday and then a 2 mile shake out run on Saturday. Thursday and Friday are complete rest days. The training is done, so it’s important to give your legs a rest. This is hard for me. I definitely get the “taper crazies”, but I refrain from running any more than scheduled! And of course during this week I will feel phantom injuries, convince myself I’m getting sick, and question why I ever do this to myself in the first place. Don’t let me fool you, I get nervous. I have that butterfly feeling all week and I hardly sleep the night before the race, but I try to remind myself that I have done the hard work and the race is really just the celebration of my training. 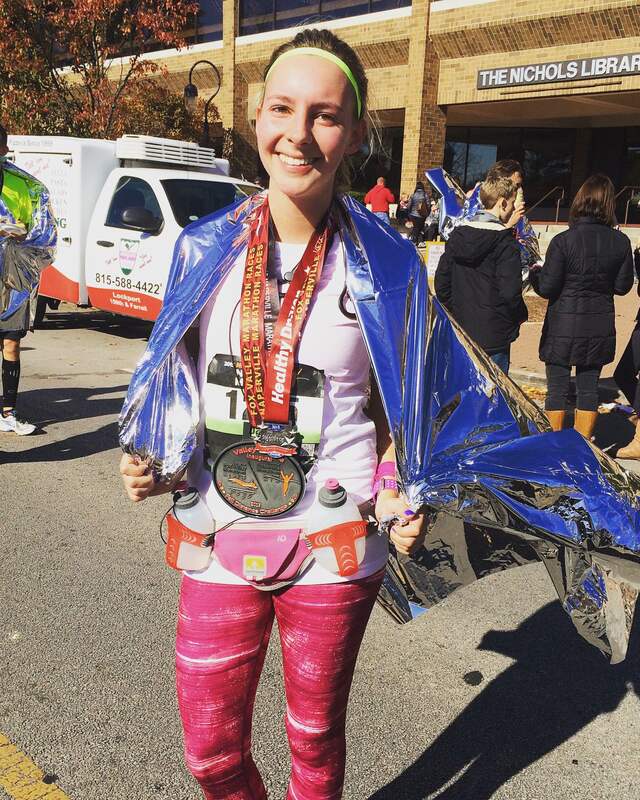 How cool is it to run a marathon? That’s what I tell myself at least. Officially 5 days away from rockin’ my third full marathon! Eek!